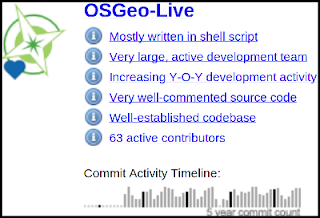 With the upcoming OSGeo-Live 9.5 release, we will make OpenHub metrics very visible, adding a "Metrics" tab from the main OSGeo-Live page, which links to our existing OSGeo-Live OpenHub summaries. 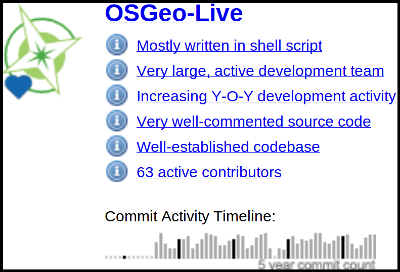 Most OSGeo-Live projects have very compelling metrics, demonstrating an established and active development community. However, there are a few projects where OpenHub metrics are dated, incorrectly suggesting a lack of project activity. As such, I encourage all projects to review their OpenHub metrics before the next OSGeo-Live release, and update where appropriate.